Federal food inspectors initiated a recall of Trader Joe’s barbeque chicken salads because the onions used in the salad may be contaminated with listeria bacteria. United States Department of Agriculture officials announced in a press release on Friday that Huxtable’s Kitchen of Vernon is recalling about 5,610 pounds of the salads. The salads were distributed at Trader Joe’s in Arizona, New Mexico, California, Nevada and Texas. No illnesses related to the salads have been reported. Officials have identified the product as having a use by July 30 and are numbered P-11079. Listeria is an organism that can cause serious and sometimes fatal infections in the elderly, pregnant women, young children and others with weakened immune systems. Again “Thanks” to CCN for the story about the recall at Trader Joes. Still nothing in either The Trib, or the PR Press. Could it be that TJs never runs ads in either paper ? The local news papers aer’nt ! Poor Brother T…but that’s what happens when it’s not kosher ! TED ! Stay away from the rectory ! trader Joes……………… The worst parking in North SLO county.. Dont sell Vodka of the gods at this store because there was already a liquor. strore in the center ? Park out on tne street… and walk in ? 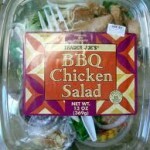 The BBQ chicken salad was recalled , but never mentioned on network news ? Thanks for ccn news My stomach needed a break..
“Unlike last year, the CDC released the data without reaching out to consumer groups and other key stakeholders who typically are notified in advance. Instead, the charts and graphs were quietly posted online Friday. The data are compiled annually to show trends for infections commonly transmitted through food and to guide policy decisions. I love all things TJ but not their chicken salad. Hey Ted, when you come to, login. I have three large bags you can have- free! What cpuld go wrong??? OH , OH! That’s one of my favorite salads that I get at Trader Joes, and I’ve checked the numbers, and I’ve been eating that one for weeks! No problems as if yett…….. its allll….. gooooood, thank one fo th gods tha t im stil ok and nought get sic from th iis salid bute wonttt ……………….. eeet any mor……..of itt…. Hello Ted….. You still there….?? ?